"This experiment demonstrates that, for the first time ever, we can film quantum mechanics – and its paradoxical nature – directly," says Fabrizio Carbone of Ecole Polytechnique Federale De Lausann. In addition, the importance of this pioneering work can extend beyond fundamental science and to future technologies. As Carbone explains: "Being able to image and control quantum phenomena at the nanometer scale like this opens up a new route towards quantum computing." Quantum mechanics tells us that light can behave simultaneously as a particle or a wave. However, there has never been an experiment able to capture both natures of light at the same time; the closest we have come is seeing either wave or particle, but always at different times. Taking a radically different experimental approach, EPFL scientists have now been able to take the first ever snapshot of light behaving both as a wave and as a particle. The breakthrough work is published in Nature Communications. When UV light hits a metal surface, it causes an emission of electrons. Albert Einstein explained this "photoelectric" effect by proposing that light – thought to only be a wave – is also a stream of particles. Even though a variety of experiments have successfully observed both the particle- and wave-like behaviors of light, they have never been able to observe both at the same time. This is where the experiment's trick comes in: The scientists shot a stream of electrons close to the nanowire, using them to image the standing wave of light. As the electrons interacted with the confined light on the nanowire, they either sped up or slowed down. 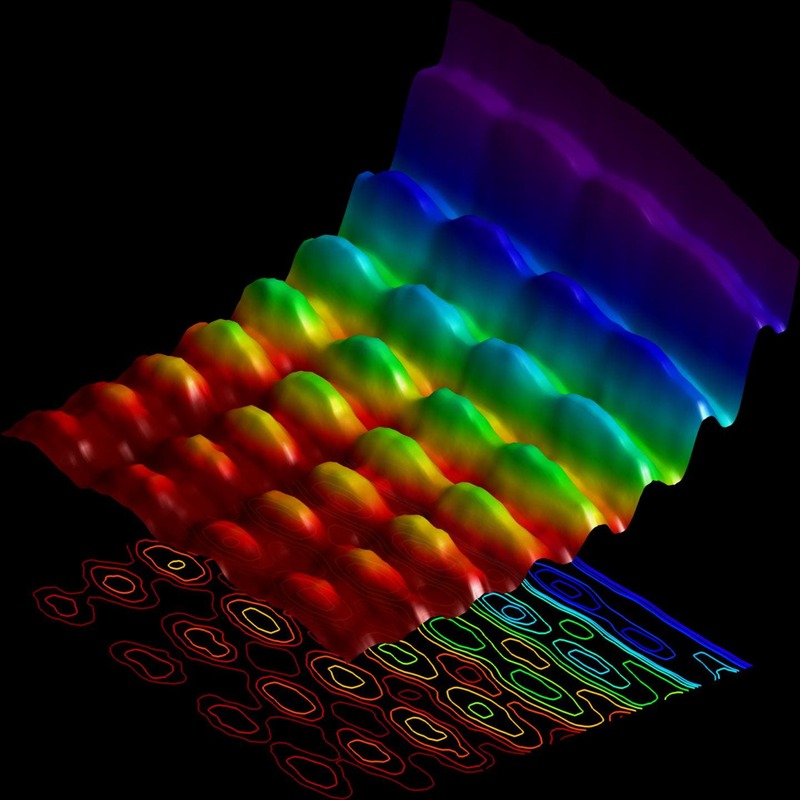 Using the ultrafast microscope to image the position where this change in speed occurred, Carbone's team could now visualize the standing wave, which acts as a fingerprint of the wave-nature of light. While this phenomenon shows the wave-like nature of light, it simultaneously demonstrated its particle aspect as well. As the electrons pass close to the standing wave of light, they "hit" the light's particles, the photons. As mentioned above, this affects their speed, making them move faster or slower. This change in speed appears as an exchange of energy "packets" (quanta) between electrons and photons. The very occurrence of these energy packets shows that the light on the nanowire behaves as a particle. This work represents a collaboration between the Laboratory for Ultrafast Microscopy and Electron Scattering of EPFL, the Department of Physics of Trinity College (US) and the Physical and Life Sciences Directorate of the Lawrence Livermore National Laboratory. The imaging was carried out EPFL's ultrafast energy-filtered transmission electron microscope – one of the two in the world.